The Log Basket is the UK's original specialist supplier of decorative logs and log wall tiles. 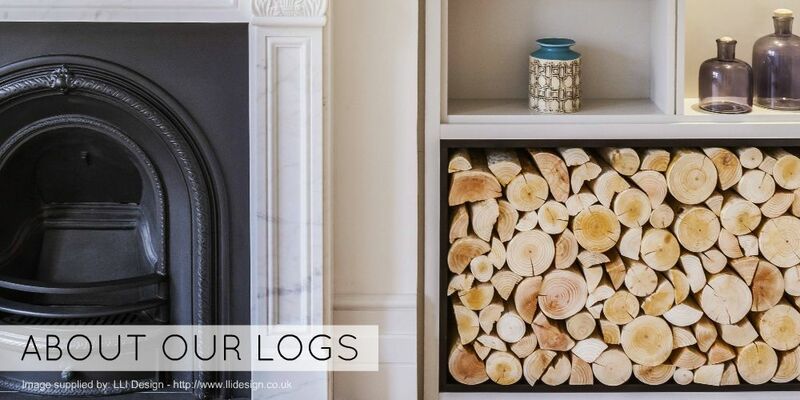 We supply our hand-finished log products for displaying within any residential, commercial or hospitality environment. We can work with you to provide custom log lengths if required - we can also apply custom stains, varnishes, paint finishes or treatments. A family-run business established in 2009, we take pride in our products and our customer service. Our timber is locally sourced from the woodlands that surround our workshops in the heart of the Royal Forest of Dean, Gloucestershire. Be assured that all of our log products are thoroughly dried to an extremely low moisture content. This is important - it is necessary to ensure that no mould is present and that all insects will be eradicated. Firewood (including kiln dried firewood) is very rarely dry enough to be used as a permanent interior feature without the risk of unsightly mould forming, or indeed insects still being present within the logs. The Log Basket's website includes many images of decorative log and log wall tile installations that have been provided by happy customers - we hope these photographs will be a source of inspiration to you and will help to visualise the potential of creating a beautiful log stack feature within your home or workplace interior. Our Instagram and Facebook feeds are updated as regularly as possible with new installations and ideas. Our Flickr and Houzz pages also serve as showcases for our products. Please do take a look. We understand that in many situations, choosing to install a log display may be daunting, or indeed a big commitment. Remember that we are always happy to discuss your thoughts and requirements with you. Just give us a call or drop us a line in an email. If you would like to send us images of our logs in your home, please do contact us - it makes our day to see how our logs, tiles and log products are used by customers and we love to share the results!